In the heart of the Normandy countryside, 60 km from Caen and 300 km from Paris, the Chateau de Canisy is a private estate classified as an Historical Monument. Surrounded by 300 hectores of vast park and forest, Canisy is registered as one of the "7 wonders of la Manche". Since the Middle Ages, this chateau has been in the same family. 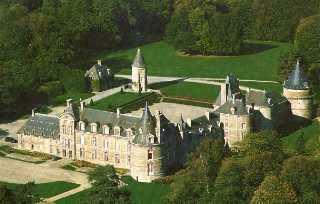 The chateau and grounds provide a vision of French history : medieval towers, a renaissance wing, the romantic park "à l'anglaise" with perspectives "à la française". Count and Countess de Kergorlay have succeeded in preserving the authenticity of this dwelling rich in history, enhance buy the warm welcome of a very professional team.